When is the next train to this station? Parking Spaces: Spaces: 720. PayByPhone #31009. Zipcar parking location. Parking Spaces: Spaces: 1,207. PayByPhone #31007. Overnight & long-term parking available. Available parking counter. Parking Spaces: Spaces: 247. PayByPhone #31005. Zipcar parking location. Parking Spaces: Spaces: 296. PayByPhone #31003. Parking Spaces: Spaces: 100 PayByPhone #30999. Served by Tri-Rail and Greyhound. 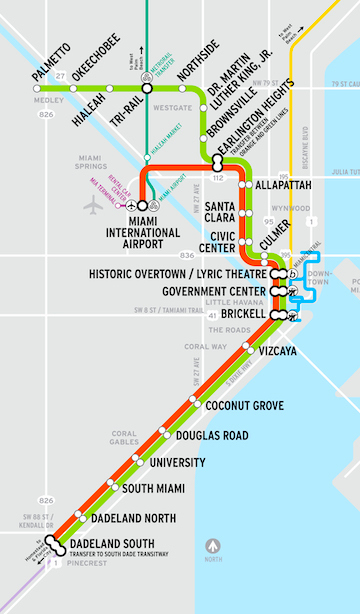 Special one-way & round-trip EASY Tickets are available at vending machines for passengers traveling to Miami Beach via Route 150. Parking Spaces: Spaces: 352. PayByPhone #30997. Overnight & long-term parking available. Available parking counter. Zipcar parking location. Garage open 24 hours seven days a week. Recommended transfer station between Orange and Green Lines. Parking Spaces: Spaces 65. PayByPhone #30993. Served by Broward County Transit. Served by Marlins Shuttle to the ballpark from April through September. MiamiCentral, Black Archives / Historic Lyric Theatre, Overtown Transit Village. Parking Spaces: Spaces: 125. PayByPhone #30989. Zipcar parking location. Parking Spaces: Spaces: 209. PayByPhone #30987. Zipcar Parking Location. Parking Spaces: Spaces: 237. PayByPhone #30983. Parking Spaces: Spaces: 1,802. PayByPhone #30981. Overnight & long-term parking available. Available parking counter. Parking Spaces: Spaces: 2,032. PayByPhone #30977. Available Parking Counter. Parking Spaces: Spaces: 1,274. PayByPhone #30979. Available parking counter.